Maximum strength that lasts up to 12 hours. Focuses on breaking up mucus. Works well for both wet and dry coughs. Strong cough medicine designed for adults. One of the most effective but has a strong taste. Non-drowsy formula that works well for breaking up congestion and mucus in your chest. Formulated for children from stuffy nose, cough and congestion. Designed for children above the age of 4. We can agree that a cough medicine must provide hours of relief for an irritating cough. That was the deciding factor for the best cough medicine that we selected. 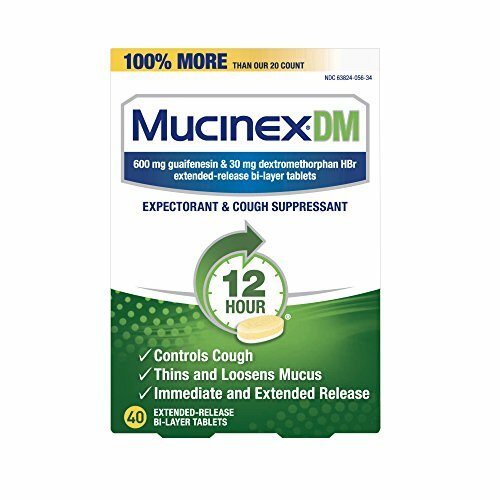 If you want to skip reading all of the details, the Mucinex DM Maximum Strength Cough Suppressant was our top choice for being the most effective at suppressing a cough. There are some things that you will want to look for when you are researching different cough suppressants. You will also need to be aware of the kind of a cough you have and are trying to stop so you get the right type of cough medicine for it. This guide will help steer you through the process so you can make an informed decision on which cough medicine is right for your specific needs. 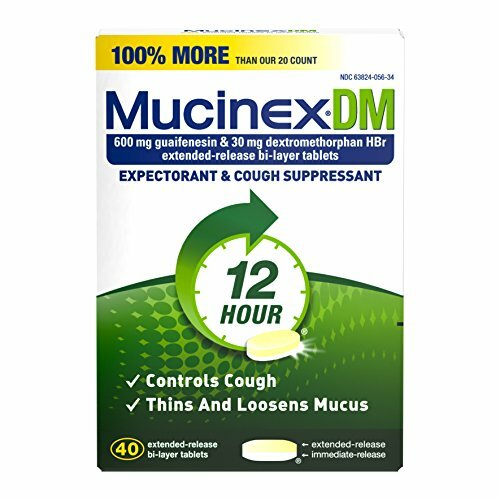 Mucinex DM Maximum Strength is a strong medicine that works to quiet coughs and help you feel better when you are sick. The extended-release tablets help both wet and dry coughs for up to 12 hours. The tablets get to work quickly, breaking up mucus and relieving chest congestion too. It is one of the few cough suppressants that work on both wet (productive) and dry (non-productive) coughs. Each tablet has two layers. The first is absorbed into the body at a fast rate for quick relief that can calm even bad coughs. The second layer dissolves more slowly, continuing to help suppress your cough for 12 hours. Mucinex is one of the most recommended brands on the market and is rated #1 among doctors, pharmacists and consumers. 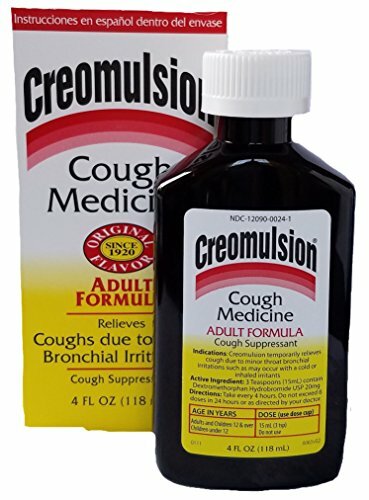 Many people have a love/hate relationship with Creomulsion Cough Medicine. They love it because it seemingly, miraculously, works to stop even the worst cough. They hate it because many people feel it tastes horrible. It is the most effective cough suppressant you can buy over the counter, without a prescription. It has no alcohol or artificial flavors and is great for soothing raw and irritated throats. If you are having a hard time getting rid of a bad cough, this is the medicine to reach for. Once you accept the terrible taste, you will reach for this medicine whenever you get a cough because you will know it works. It is not for kids under 12 years of age. Creomulsion has been around for a long time and once you see how effective it is, you will understand why it has had such lasting power. 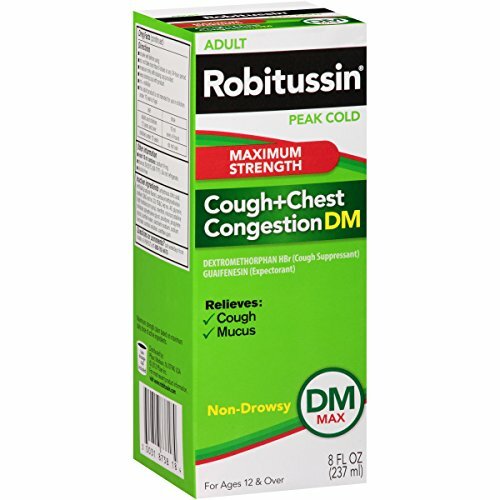 Robitussin is another well-known name in medicines that have been around for decades. This non-drowsy formula relieves chest congestion and loosens the mucus in your chest so the coughs you do have are much more productive. This is a good medicine for persistent coughs that want to hold on and not go away. The cough suppressant ingredient in this helpful medicine controls coughs and takes care of other symptoms as well. Coughing can be very disruptive to your career, during school, and even at home. Even keeping your spouse up if you are coughing through the night. 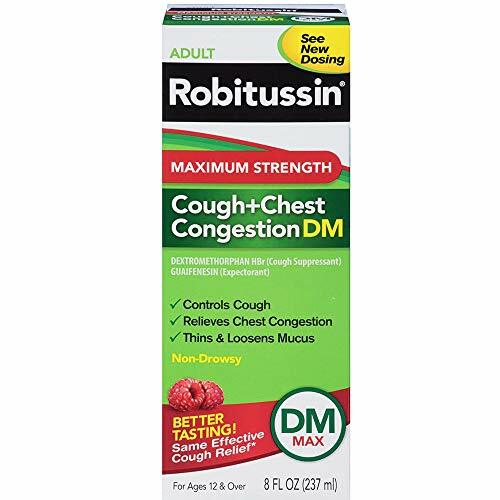 Robitussin DM will help you get rid of the congestion while taking care of the cough too. 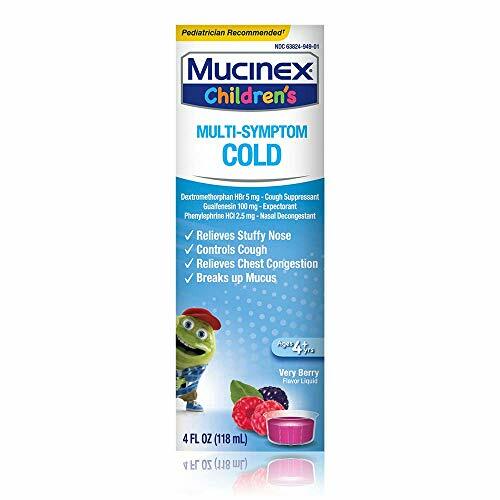 Mucinex Multi-Symptom for kids will help clear up a stuffed nose, cough, chest congestion and break up mucus. There is a dosing cup for children above the age of 4. The active ingredients for Mucinex Multi-Symptom are Dextromethorphan HBr, Guaifenesin and Phenylephrine HCL. Make sure you don’t exceed the maximum of 6 doses in a 24-hour period and consult with your physician if your children are taking antidepressants. From our testing we found that Mucinex performed really well to lessen symptoms. This also helped with the crying that went along with them! There are dozens of cough suppressants on the market, from brand name to generics for almost every store you can think of. With all of these choices available, choosing one to fight your symptoms can be a real challenge. Finding the right cough medicine can make you feel much better and shorten the duration of your cold if it effectively reduces symptoms. Coughs actually perform an important function because they help to clear your lungs of mucus and other irritants. The three cough suppressants that we have reviewed above are all excellent and effective cough suppressants with solid, long-term reputations. These medicines have been around for decades and for good reason. Any one of them would make a good choice to help you control your cough and to help you to feel better. To learn more about choosing the right cough suppressant for your needs, read the buyers’ guide below. It has all the information you need to know how to properly research a medicine and be assured that it is the right one for your needs. With the right knowledge, you will be able to make an informed decision and know that you have the best cough suppressant you can take. The average adult gets two to four coughs each year. There are two basic kinds of coughs that people seem to get. One is a dry cough and the other is a wet, chest cough. Coughs can be very helpful in getting mucus out of the lungs and preventing other problems from occurring. Dry cough – A dry cough is usually associated with irritation of some kind such as smoke, dust and other irritants. Dextromethorpan is a common ingredient that is used to treat dry coughs. They can be very uncomfortable and if they are persistent and hard, they can make your head, chest and even your ribs hurt from the force of coughing so much. Chest cough – Chest coughs can be productive but only if you can get the mucus out of your lungs and airways. A common ingredient used to treat this type of cough to make it more productive is guaifenesin. It is an expectorant that helps your coughs be more productive. People may notice that they seem to cough more often when they use an expectorant. To help minimize this coughing, you may want to look for a medicine that has both an expectorant and a suppressant in it. There are many types and brands of OTC (Over the Counter) cough suppressants on the market but there are three basic types within all those products. Expectorants – An expectorant will thin the mucus and make it much easier to cough up the mucus and get it out of your system. While it is not a suppressant, it is an important way to make your cough beneficial and better for you than just pointless coughing that does nothing but make you feel worse. Suppressants – A good quality suppressant will reduce the number of times you cough. This medicine will help you feel better and not spend all your time coughing. Bad coughs can disrupt your sleep and even cause you to throw up if they are hard enough. If you are trying to minimize coughing in a child, make sure that the medicine you give them is designed for children. It may not be as strong as the adult medicine, but younger children’s systems can’t handle adult levels of certain meds. Combination Cough Medicine – Combination medicines can just have expectorants and suppressants in them or they can be an all-inclusive medicine and have ingredients for stuffy and runny noses, sinus pressure and more. For a really bad cough you may find that a specific cough suppressant rather than medicine for all cold symptoms will work on the cough much better. Cough Drops – Cough drops can be a big help when it comes to suppressing a cough. You can take cough drops along with cough suppressant or expectorant. Make sure the cough drops you get are not simple vitamin c drops or scratchy throat lozenges. You need actual cough drops that have the menthol ingredients in them to see some results. There are several ways of thinking about how to treat a cough. Some doctors may tell you not to treat it unless you cannot eat or sleep or do you day-to-day activities. However horrible it sounds, when you are coughing up mucus it helps to keep your lungs clear which is very helpful, especially if you have asthma or if you smoke. The ingredients that are in cough suppressants may cause other medicines to not work or can interfere with them. An example is dextromethorphan which can affect depression medications. There are also cough medicines and cold medicines that can cause your blood pressure to go up too. If you are taking other medications, ask you doctor if you need to take a cough suppressant. The following tips will help keep you safe when you are using cough suppressants. Cough suppressants are not dangerous when they are taken properly, in the right dosages but you need to be mindful of these tips whenever you take them or are giving them to your children. Read the Label – Make sure you know what you are taking for your cough so you know what it is doing to your body. Is it a suppressant, an expectorant, or both? Only buy what you need to take care of your exact symptoms. Don’t take medicine for more than a week – If the cough is severe or hasn’t gotten better after a week, it’s time to see the doctor to rule out something more serious. Take (or give) the correct dose– Don’t drink the medicine out of the bottle. It is important to take the right dosage so you do not take too much or too little. High doses of cough medicine can be very dangerous and cause seizures or worse. Use combination medicines with caution – Try to only use medicines that are taking care of the exact symptoms you have. You also need to make sure that you are not doubling up on any ingredients. Keep out of reach of children – if you are giving medicine to your child, make sure that you are using a medicine that they can safely take and don’t give them too much. When giving cough suppressants to kids, it is better to keep a chart so you always remember what time you gave the last dose. Children under 4 shouldn’t have cough medicine unless their pediatrician has prescribed it. Always follow the dosage directions. Don’t treat every cough – Sometimes not treating the cough is the best thing, especially if it isn’t interfering with day to day life or sleep. Give your body a week to heal itself. If it doesn’t, be sure to see your doctor. Having a bad cough from a cold or the flu is never fun. Sometimes it can cause your head to pound and if the cough is severe enough, it’s possible to feel like you’re coughing so much you can’t breathe. Cough suppressants are designed to reduce the amount of coughing so you can get some relief while you are getting better. There are so many cough suppressants on the market that it may feel impossible to figure out the right one to take. Take a good look at the three top-rated cough suppressants we have featured in this guide. All three of them are top-of-the-line medicines and they have been proven to work time and again. The information in this guide is designed to help you understand cough suppressants better so you can choose the right one for your symptoms and needs. Knowledge is the best way to make informed decisions and will result in you choosing a product that will actually help you feel better. A product that will turn that cough into something productive while you are getting better.